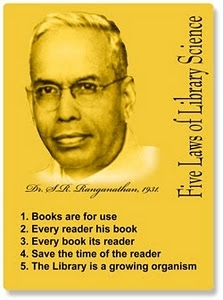 Most of you learned Ranganathan’s Five Laws of Library Science when you were in library school. You discussed them and have probably since forgotten them. Students in my online graduate course are discovering those laws this week, and as I reviewed them it struck me once again how incredibly relevant they still are and how brilliant and prescient Ranganathan was. S. R.(Shiyali Ramamrit) Ranganathan and with Melvil Dewey, both born in the 1800’s, can be seen as the creators of librarianship. However, while even non-librarians are familiar with the greatest of Dewey’s contributions (others are the founding of the American Library Association and the originator of Library Journal­ – did you know Dewey did that? ), it’s unlikely that many outside the profession have ever heard of him. In this age of always striving to move forward and be modern and/or relevant, there is something comforting about looking at our roots and discovering unchanging truths. This is a reminder that they are not to be hidden away. It repudiates the concept of closed stacks, but for me it also is a caution about restricting students from reading books not on their Lexile level and it suggests that requiring a parental note before a student can borrow a book deemed too sophisticated or more specifically having content that might be challenged is not how librarians should be operating. For me, it’s also a message about weeding. Those dusty titles sitting on your shelves are not being used. Libraries are neither warehouses nor museums. Why are you keeping them? Libraries need to have something for every user. It means if you have ELL students you need to be looking into getting books in their language. Recognize visually challenged students should have access to books in large-type. As you prepare your orders, do you think about who will be interested in this title? You don’t purchase something merely because it has a good review. In whose hands do you see it? Does it connect to a curricular area? Do you know one or more students who like this author or type of book? 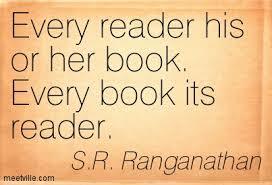 Ranganathan used “book” generically. He also meant magazines. Today we should be thinking about e-resources and databases. Who will be served by adding this to the collection? This may be my favorite of his laws. I personally know someone who was a lifelong nonreader. Quite by accident, she decided to try one of those wildly popular titles everyone was reading and talking about and fell in love. It was the first in a trilogy, so she read all three. And re-read them, and re-read them. Finally she knew the text virtually by heart, and was ready to take a risk and read another in a similar vein. Suddenly she is a voracious reader, proudly announcing to me she got a library card and has been shopping at Barnes and Noble. It is a complete reversal. I travel everywhere with my e-reader and patiently read while waiting my turn to be helped (PERSONAL NOTE OF HORROR: My Nook broke this week – I had to replace it in under 24 hours or risk insanity). Invariably someone tells me they love to read and often trace it back to the one book that got them started. And that is a special role and gift of our profession. We know our users and we know our books. It is our delight and our mission to connect our users with the perfect book for them. 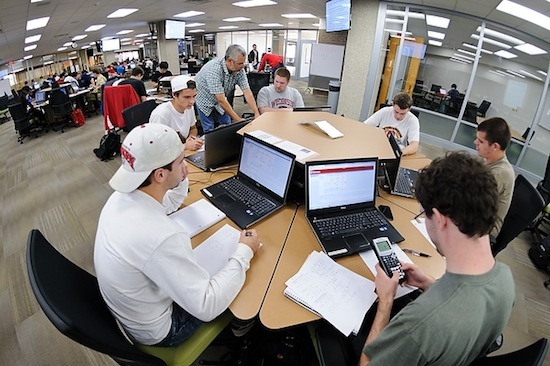 The purpose of library organization is to do just that – and the work of Ranganathan and Dewey made it possible. However, as we have discussed, there are other thoughts today. The rationale for genre-fying the collection is to save readers’ time. It also means you need to regularly look at you facility and procedures to see if you have any obstacles keeping readers from easy access to what they need and want. School librarians need to remember this law when students ask for assistance. Too many times, we want them to learn to do it for themselves and just give directions to be followed. Yes, they need to learn, but sometimes the need is to get to the answer. You can impart the lesson by going with the student, explaining the steps as you do them. Ranganathan recognized that a static library is a dead one. Even in today’s heavily technological world, bookshelves do get filled. In the haste to add more space for computers and other devices, libraries are reducing shelving to a bare minimum. These are crammed with what is being retained, but where will the new print acquisitions go? Certainly there won’t be as many as the past, but they are still being purchased. On a larger level, this law speaks to the constant change libraries undergo as they transform themselves to meet the needs of users and reflect the technological and other changes of society. I suggest it is time to bring Ranganathan and his five laws to the attention of our users. Print them out in a large, easily read format, frame and hang it in your main area. Put his name and 1931, the year they were published, at the bottom. It is a great explanation of what your program does and why. As I said, the Third Law is my favorite. Which is yours? Or which challenges you?